Zagreb Croatia is the capital and the largest city of Croatia. It is economical, political and educational center of Croatia. The first mention of Zagreb dates back to 1094. The city has a rich history. And while the Upper town offers most of memories of the past, you can find interesting sightseeing in the downtown as well as outside the city center. Zagreb originally existed as two different city centers – Kaptol which was inhabited mainly by the clergy, and which houses Zagreb Cathedral; and Gradec inhabited mainly by farmers and merchants. These two cities were united in 1851 by ban Josip Jelačić after whom the main city square is named. Tkalčićeva Street, today famous for its small houses featuring numerous bars, at that time was actually a creek. In recent years Zagreb has become an appealing tourist destination so it is no surprise the city is constantly recording an increased numbers of tourists. This has resulted in the opening of numbers of hostels and private apartments, interesting dining places and an increasing number of different activities. Below you'll find Zagreb map. Zagreb is located in continental Croatia (in the northwest of the country), on the shores of the River Sava and at the southern slopes of the Medvednica mountain. Vienna (Austria) is 370 km away from Zagreb, Budapest (Hungary) 345 km and Ljubljana (Slovenia) 140 km. Croatia's well developed state roads and motorways, make Zagreb well connected to other regions of Croatia. The distance from Zagreb to Pazin, Istria is 215 km and it takes 2:30 hours of driving; Split is 410 km away and a 4 hour drive while Osijek is 280 km and 3 hours of driving from Zagreb. Whenever you visit Zagreb you will find something interesting to see and experience. But the best time to visit Zagreb is in spring and early summer. In early to mi-August, the temperature can be quite high and many locals do take their annual holidays at this time. You might find some of the local designers’ shops and bars closed in this period of year. Don’t forget that Zagreb can be very interesting in December when Christmas stalls and activities take place in many of the city center’s squares. Croatia is most famous for its beautiful coast but why not experience something different. Zagreb is a small central European city so you can experience a part of the history of the Hapsburg monarchy without much walking. Although Zagrebacki strukli (cottage cheese strudel which can be cooked or baked, salty or sweet) are known as Zagreb's signature dish, it will keep you well fed if you eat it as a main course for lunch or dinner. Other domestic meals are duck with mlinci (a special kind of pasta), sir i vrhnje (Cottage cheese with cream), kremšnite (slices in flaky pastry) and orehnjača (a traditional walnut roll). Just to make sure there is no misunderstanding, we are not talking about wild parties. But there is something charming when you walk through Tkalčićeva street and the bars are full of people or to sit and drink a cool glass of wine or beer on Stross (Upper Town). Dolac market, Mirogoj cemetery, Upper town, Zagreb Cathedral… All of this and much more charge nothing for visiting and enjoying. At the end of June 2015, 10 percent more tourists visited Zagreb than the year before. Tourists say that they love Zagreb because it is not expensive, the locals are friendly, the city is clean and all city's sights can easily be explored on foot or bicycle. For a full list of things to do in Zagreb, head here. For a taste of things to do in Zagreb, stick here with us where we list just a couple of things to do in Zagreb. You can walk through the Upper town any time of day (but bear in mind that some of the attractions have their working hours). From April until October every Saturday from 5 p.m. until 8 p.m. the main historical characters from Zagreb past walk by and you can have your photo taken with them. Catch the short funicular ride from Ilica up to the Old Town and definitely make your way back down through the only remaining gate from the Old Town, the Stone Gate. Dolac is the most visited and famous market in Zagreb located in the center of the City. It is vibrant, noisy, and lively, and the best place to feel a local vibe, and buy fresh seasonal fruit and vegetables, meat and fish. Zagreb Cemetery is another location which tourists like to visit. It is a heritage site famous for its arcades, pavilions and tombs which are real monuments of architecture. Zagreb’s most popular park is loved by locals and tourists alike. If you are tired of sightseeing just go to Zrinjevac and lie down on the grass. Don’t forget that from April until October every Saturday from 11 a.m. until 1 p.m. there are Promenade Concerts in Zrinjevac . You can also put on historical clothing and have your photo taken. During winter Zrinjevac has a wonderful entertainment program. To have a coffee on Saturday morning in Zagreb is a custom of locals and ‘must do’ thing. On the so-called Špica (the rush hour) all locals from different part of town come to the center of the city to drink coffee in one of the bars in Bogoviceva or Tkalciceva Street. Actually, anywhere in the center where you find a free table sit and observe a river of people. To truly fit in with the locals, dress well! For all of those who like to stay active, Zagreb has a few fitness parks in which you can exercise. You can visit the one in Maksimir Park and at the same time enjoy Zagreb’s oldest (opened in 1794) and largest public park. It’s also a home to the town’s Zoo. Near the mail Railway Station there is also one fitness park and it is ideal for those who love to exercise in the open. A march through Zagreb accompanied by the armorer, trumpeter, drummer, standard-bearer and commander starts from April until October at Dolac at 11:40 am, and ends at 2:20 pm, every Saturday and Sunday, as well as 31 May ( City of Zagreb Day ), 18 October ( Cravat Regiment day ) and 1 January ( New Year's Day ). Two events particularly celebrate this side of the Upper town are The Secrets of Grič and Dvorišta. The Secrets of Grič is an interactive theater night tour where you can discover the historical and mystical side of the capital. The tour is conducted each Friday in Croatian and each Saturday in English, from May to September, starting at 9.00 p.m.
Dvorišta (Courtyards in Croatian) takes place in mid-July, for nine days. This event offers visitors a chance to experience part of the town that is usually shut behind facades, and doors. A Travel Guide To Zagreb Croatia | Pin Me For Later! Also situated in the Upper town this museum is everything but not ordinary. At the beginning, this idea to expose the relics of broken relationships, was a travelling exhibition. But since 2011 one of the palaces of Zagreb’s Upper Town hosts a museum. It also has a coffee bar so you can have a break. Enjoy in a beautiful panoramic view of Zagreb from Lotrščak Tower and wait for noon when the Grič cannon fires as a sign for the bell-ringers of the city's churches. This marking of midday is a tradition from 1877. While you are walking through the Upper town be sure to take a photo outside of St Mark’s Church which is one of the oldest buildings in Zagreb. 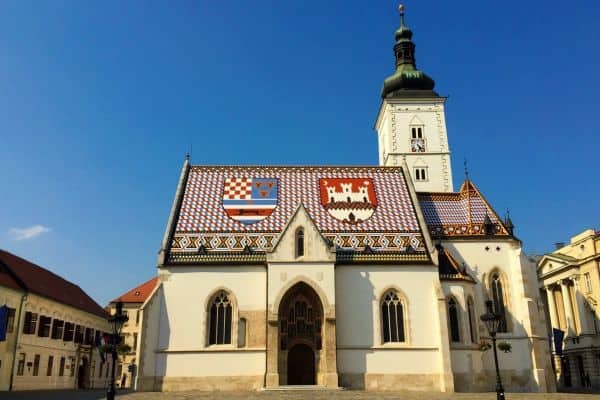 On the roof, tiles are laid so that they represent the coat of arms of Zagreb and Triune Kingdom of Croatia, Slavonia and Dalmatia. Zagreb Cathedral, located close to the main square, is the tallest building in Croatia. It has many Gothic architectural elements. British Square is located only 10 minutes by foot form the main square. From Monday to Saturday you can buy fruit and vegetables in this square. On Sunday it is reserved for an antique fair. Walk through numerous stands and when you get tired have brunch or just a coffee in Kava Tava. If you ask the locals they will tell you that in the last few years Zagreb restaurant scene has genuinely improved. What we like the most is the fact that you don’t need to go to fancy restaurants to eat good. But if you want to, we recommend Carpaccio in Teslina, Apetit City in Masarykova, Pod gričkim topom between the Upper Town and Downtown, to the left of the funicular railway and Mano in Medvedgradska. There are places where you can eat great meals prepared in a quirky and modern way like Mali bar, Munodaka, Bistroteka, Lari&Penati… all located in the center of the city. If you would like to try a traditional Zagrebački štrukli, go to La Štruk (located in the Skalinska Street) or hotel Esplanade near the main Railway station. Hamburgers are in fashion again in Zagreb. There are few good places where you can eat great hamburgers which is also great for those who travel on a low budget. Be sure to visit Yellow Submarine in Frankopanska and Papa’s in Tuskanac. Fini zalogaj in Radiceva offers traditional Bosnian speciality, ćevapi, but prepared in a non-traditional Croatian way. Zagreb offers a variety of accommodation suitable for every budget: hotels, hip and cool hostels, and apartment rentals. Many of them are situated in a center of the city so the sightseeing is easy. Prices are cheaper than along the coast. Daily rental for 2 starts from 40€. Hotels are cheaper during the summer than winter when they get lots of business travelers. Also, hotels are cheaper during the weekend than during the week. You can try some of the hostels like Chill Out Hostel in Tomiceva near Funicular, Art Hotel Like in Vlaška, Hostel Chick in Pavla Hatza or private accommodation like ZIG ZAG which offers a few apartments at the different locations in the Zagreb’s center. If you prefer a hotel, most famous one is Esplanade which has hosted many Hollywood stars. Hotel Dubrovnik is situated on the main square and hotel Jaegerhorn also has unique position in the courtyard of a building on Ilica street. Read our full post on accommodation in Zagreb. In Croatia drinking coffee is a ritual for itself. So when you are in Zagreb, experience a culture of sipping coffee for hours. You can always sit in any of the coffee bars in Tkalčićeva street or in Cvjetni Square. However, if you want to escape from city noise, we recommend few interesting places. If you are enjoying in the Upper Town, don’t miss to have a coffee in Palainovka on Ilirski trg. Velvet is a great little cafe bar-gallery tucked away at the corner of Tuskanova and Dezmanova Street. In the Downtown you will find Amelie which also offers cakes, quiche and great ice-creams. U dvorištu (In the Courtyard) is located ten minutes by foot from city centre in Zerjavica Street; and it serves different types of coffee, varieties of tea and all sorts of beer. A must visit place is also Kava Tava which is located at the beginning of Tkalciceva street and on British Square. You can have a coffee but also eat something sweet (American pancakes) or have a sandwich. Remember that even if locals invite you for the coffee it doesn’t necessary mean you will actually drink a coffee – it is the invitation for hanging out. In the Basement which is located at the bottom of Funicular and Pod zidom near Dolac you can drink a wine and have a ‘plata’ (variety of sliced ham, prosciutto, and cheese with olive oil). Wine bar La Bodega in Bogoviceva also offers prosciutto, cheese and olive oil to eat while you drink wine or a cocktail. Zagreb usually hosts a number of attractive concerts and exhibitions during the year. Be sure to check whether there is anything on at the time of your visit. During summer in the Upper Town you have Summer at Stross; a variety of shows for the kids and a music program for adults. Also, at the end of September, you can enjoy Gričevanje. It is the combination of concerts and parties, robotic performances, exhibitions and DIY workshops for children and adults. Beside these two events on the Upper Town, there is the Gradec Summer Cinema. Here you can watch movies for free on Catherine’s Square. If you come earlier you will probably catch a seat but if you don’t, just sit anywhere on the floor. Don’t worry – it’s normal, it is what gives this event a unique atmosphere! Something different is Mali plac na Tavanu (Little market in the Loft) where you can buy organic fruit and vegetables, some local specialties and raw food. It is organized in a residential attic but it is also sometimes organized at some other locations. So be sure to check the timetable and the venue on the official Facebook page. Zagreb is very well connected and can be reached by bus, plane, car, even by train. Zagreb International Airport is the main airport in Croatia. It connects the country with almost all bigger European cities Paris, Frankfurt, Rome, London, Istanbul, Munich, Zurich, Vienna, Brussels, Barcelona, Moscow, Athens as well as Doha and Dubai. The Airport is situated 12 kilometers from the city center and you can get to town by taxi (the price is around 150 kuna or 20 euro – make sure to ask for the price before you sit in the taxi) or with the Airport’s bus which drives to the main bus station. The price of a one-way ticket is 30 kuna (around 4 euro) and the ride lasts 30 minutes. From the main bus station you can catch the tram (number 6) for the city center (the distance is five tram stations). Motorway A3 Bregana – Zagreb – Lipovac connects Zagreb with Northern Europe. 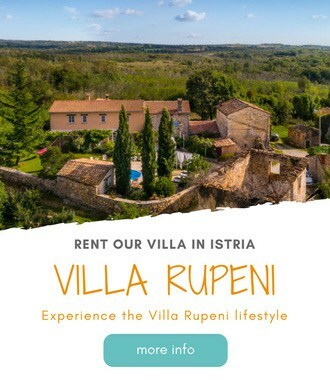 You can come to Zagreb using the Istrian Ypsilon which connects Istria with the Slovenian border and Rijeka from which highway A6 leads you to Zagreb. In the East there is motorway A4 which connects Croatia with Hungary. Zagreb bus station is situated only five tram station from the center of the city or 20 minutes by foot. You can buy a ticket online and if you are going from Zagreb to any other city in Croatia the connections are really good. If you are travelling from other cities in Croatia to Zagreb you can also reach the city by train (there are connections with Split and Osijek amongst the larger cities). Zagreb is also connected with other European countries like Austria, Germany, Slovenia, Serbia, Hungary, Bosnia and Herzegovina. The train generally takes the longest to get from one point to another in Croatia. However, if you have time on your side and want to relaxing way to see the country, this might be the way to go. Zagreb is easy to navigate on foot, bicycle, or public transport. If you stay in the center of the city you can see all the main attractions on foot. If you find yourself outside of center you can use a tram, bus, taxi or bike. There are a few different types of tram ticket. You can buy a standard one for 10 kuna and it is valid for 90 minutes but only in one direction. At night time the price of this ticket is 15 kuna. A daily ticket costs 30 Kn and you can ride as much as you like in any direction. The same conditions apply for 3-day tickets (70 kuna); 7-day tickets (150 kuna); 15-day tickets (200 kuna) and 30-day tickets (400 kuna). You can buy a ticket at Tisak kiosks or inside the tram from the driver. The same ticket can be used for the tram and the bus if the bus stations are in the Zone 1, which most of the tourist destinations are. So if you buy a tram ticket you can use it also, for example, to visit Mirogoj Cemetery or to take a ride on the Funicular. There are a few different taxi services in Zagreb (Cammeo, Radio Taxi Zagreb, Eko Taxi and individual taxi drivers). You can order taxis by phone or you can find them parked in the different parts of town (taxis cannot pick you up in the street, unless you have ordered one). In the city centre there is a lot of taxi stations (Gajeva Street, Petrnjiska Street, Mesnička Street, Masarykova Street, Vlaška street…). For example, a ride from the main bus station to the centre of the city will cost you around 30 kuna. As of 2016, Uber is also available in Zagreb. Cycling is also an interesting way to explore the city. In Zagreb there is a system of public bicycles. So you can take a bike at one station and leave it at another. All information is available on the official web page of Nextbike but generally it is easy to use. You just need to register yourself and activate an account by paying with a valid card (pay 79 Kn which is a onetime payment only). Afterwords you just take a bike from the station. Every first 30 minutes usage in every day is free after which each additional hour costs 8 kuna and depending on the length of your rides it reduces your next bike credit. In Zagreb, you'll find all major international car rental providers like Hertz, Sixt, Avis, Europcar. Oryx and Nova are local car rental companies. They all have offices at the Zagreb Airport, and at various locations in town. We use Rentalcars when booking a car in Croatia, and elsewhere. And we highly recommend using them. They offer very competitive prices, work with all major car rental companies, and provide super easy online booking. As in the rest of Croatia, if you rent a car during the tourist session, it will be more expensive than if you are travelling in Croatia out of the main season. Most cars in Croatia are manual, so if you prefer an automatic, be sure to order one in advance. It goes without saying that automatic cars are more expensive to hire than manual cars. Here is our post on car rental in Zagreb. You can also read our full posts on driving in Croatia, and car rental in Croatia. Traffic jams are quite frequent in Zagreb. Locals prefer a car over a public transport. This makes parking in downtown difficult to find. There are few public garages in downtown: Tuskanac, Cvjetni Center, Importanne, Petrinjska, Langov Trg, Sheraton. Importanne Center and Importanne Gallery offer downtown parking at 5 Kn an hour during a day (7 am-10 pm); only 2 Kn an our for overnight parking (10 pm-7 am); and 93 Kn for daily parking (24h). Both garages are just two tram stations from the main square. One tram station from the main square, Tuskanac Garage is the most affordable garage in downtown. Parking costs 4 kn an hour during a day (8 am-9 pm); only 1,5 kn per hour for night parking (9 pm-8 am); and 40 kn for a daily parking (24h). Weekly parking ticket costs 140 Kn. A garage at the Cvjetni Center is the most expensive. Here, you'll pay parking 12 kn per hour. Garages in the Petrinjska Street and Langov Trg are very close to the main square. The price of parking is 5 kn per hour during a day (8 am-9 pm); and 2 kn per hour during a night (9 pm-8 am). Street parking is permitted in the designated areas. It is organized in four zones, depending on the distance from the city center. All metered parking is enforced Mon-Fri from 7 am until 9 pm (until 8 pm for zones II, III, IV); and Sat from 7 am-3 pm. Parking is free on Sunday, and public holidays. Parking costs 6 kn per hour in Zone I (maximum parking time is 2 hours); 3 Kn an hour for Zone II (maximum parking time is 3 hours); and 1,5 Kn per hour in Zone III (no time limit). To park a car on the Upper Town you can only buy a daily ticket which costs 500 kuna. Outside the city center you can still find free parking spots but the city is constantly spreading parking zones. For fresh fruit and vegetables but also meat, fish and eggs visit one of the green markets. The most popular are Dolac, British Square, and Kvatric Square. Here, you will also find homemade pasta and different dairy products. Dolac is open from 7 a.m. until 2 p.m. from Monday until Saturday; and from 7 a.m. until 1 p.m. on Sunday. Markets on the British Square and Kvatric Square are open from 6.30 a.m. until at least 4 p.m. In Zagreb there are lots of supermarkets (Konzum, Billa, Interspar, Diona) where you can buy groceries. On the main square there is a Muller which offers wide range of products (cosmetics and perfumes, toys, everything for the household…). There are also a few Drogerie Markt (DM) stores offering similar products. If you need a pharmacy you will find them all over the city. The City Phamarcy is owned by the City of Zagreb and the one on the main square is open every day all day. In Petrinjska street there is a herbal pharmacy Lavanda Mia that works from Monday until Saturday. In Jurišićeva just off the main Square near McDonald’s you will find a private pharmacy Farmacia which also works from Monday until Saturday. For clothes you just walk through Ilica and you will find many shops. Some of shops in downtown remain closed on Sunday. Although this is rapidly changing in the effort to revitilize downtown shopping (as opposite to suburbian shopping mall culture). On Cvjetni Square you will find Cvjetni shopping center. Cvjetni is open from Monday until Saturday from 9 a.m. until 9 p.m.; and on Sunday and during the holidays from 10 a.m. until 6 p.m. If you like unique pieces of clothes, Zagreb has a number of local design stores with really nice clothes, like Nebo, Iggy Concept Store, and Hippy Garden. Zagreb also has some quirky vintage stores like Ulicni ormar (our favorite! ), Vintage Mademoiselle & Antiquité, and Lola. If you would like to buy a Croatian souvenir go to the Croatian Designer Superstore or Take me home. You will find all sorts of products which aren't too expensive, can easily fit in your bag, and are created by Croatian designers. In Radiceva Street go to the Museum shop “The Story of the Salt”. Here you can find out how people used to produce salt in the place called Nin (near Zadar). You can also buy some ‘salty’ souvenirs. The Croatian currency is Kuna so make sure you have enough kuna for your trip. You can exchange money in the banks, exchange offices, hotel receptions. The biggest banks are mostly part of the international banking groups. Credit cards can be used in almost all places (hotels, restaurants, shops) but we recommend you ask the personnel just in case. ATM machines you can find everywhere and they have an option for different languages. In the center of the city there is free WiFi (on the main square, on Zrinjevac park, on the main railway station, Dolac Market). Many of the restaurants and bars also have free WiFi, but they will usually have a password which is written on the bill. Almost all accommodation come with free WiFi internet. Learn all Zagreb essentials with our Zagreb Travel Guide. Plan your activities in Zagreb with our detailed guide to things to do in Zagreb. If you plan to stay in Zagreb, check a list of recommended accommodation in Zagreb Croatia. Find out where to eat in Zagreb with our post on best restaurants in Zagreb. Check also recommended places to have a lunch in Zagreb. Our quick guide to Zagreb for couples, and Zagreb Itineraries for travelers, not tourists. Have you been in Zagreb? Any questions? Please leave them in the comments below. 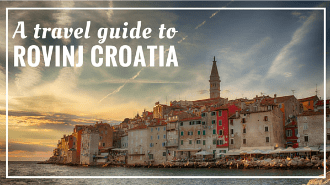 Please can you give some advice about taking a bus from Trogir to Zagreb – is that possible? Our cruise ends in Trogir and we want to just catch a bus to Zagreb. We are going to hire a car at Zagreb when we arrive and drive down to the lakes for 3 nights and then via Zadar to Trogir for 2 nights before our cruise leaves. Hi Frank and Vera: thank you very much for your informations. Can you please help me, my husband and I will celebrate our 27 anniversary in Croatia. We have 5 nights. thanks for reading. Bus is definitely better option than train. Check flix bus. They have the most affordable prices, and you can book online.